Welcome to another installment of If My Book, the Monkeybicycle feature in which authors shed light on their recently released books by comparing them to weird things. 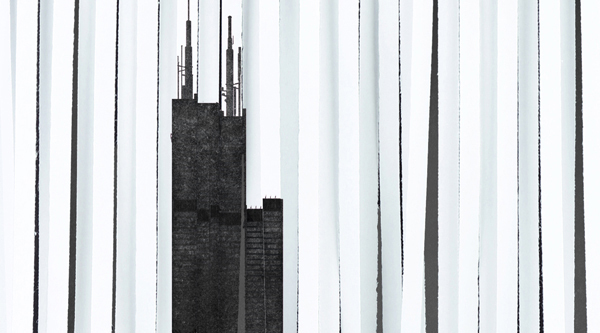 This week Michael A. Ferro writes about his debut novel, TITLE 13, just published by Harvard Square Editions. If TITLE 13 were a dog, it would be a mangy, yet lovable 13-year-old mutt that had been recently turned over to the pound after its owners grew tired of its incontinence. TITLE 13 would look around at the other younger, more vivacious dogs and try to find a spot near the back where it could sit and think and wonder what had changed and why it had changed. TITLE 13 would then pee without knowing and lie in it. If TITLE 13 were a piano, it would be a 100-year-old upright that had once been played by Fats Domino but has spent the better part of three decades in someone’s suburban garage in Detroit. A young, ill-tempered boy will have recently taken a baseball bat to its original ivory keys and left them broken and jagged, resembling the teeth of a hobo who once tried to eat a delicious-looking rock. If TITLE 13 were a hat, it would be a Union kepi. If TITLE 13 were to get lost in an unfamiliar city, it would walk around and pretend to know where it was going while actually feeling terrified and anxious the entire time. If TITLE 13 were a painting, it would be a lush, lavish portrait of a Napoleonic War hero dressed in his finest regalia with accouterments of medals, tassels, and epaulettes, while all the meanwhile a mischievous child has gone and drawn a pair of glasses and buck teeth upon his face with a black Sharpie. If TITLE 13 were twins, they would be fraternal and never see eye to eye. If TITLE 13 were a bird, it would be a penguin wearing an actual tuxedo. If TITLE 13 were an itch, it would be at the center of your back. If TITLE 13 were a Beach Boy, it would be early ‘70s Brian Wilson, overweight and lying in his bed. If TITLE 13 were an acquaintance, it would be someone that you felt an instant connection with but then later at home you thought about them in greater detail and felt that they were possibly hiding something. The next time you saw TITLE 13 at a social gathering you would study their behavior for any telltale signs of a psychological disorder or sociopathic tendencies and notice that TITLE 13 will no longer look you in the eyes and ducks out of every photograph. A few weeks later, you call TITLE 13 to talk, but TITLE 13 has disappeared and no one has seen them for a while. If TITLE 13 were a flavor of gum, it would be cinnamon. If TITLE 13 were a vacation, it would be a trip to Italy where you lose your passport and your wallet gets stolen, but you also ate the best pizza of your life, touched Michelangelo’s David, and shared a cab with Isabella Rossellini. If TITLE 13 were a mustache, it would be a handlebar. If TITLE 13 were a pasta, it would be fusilli. If TITLE 13 were an old childhood friend, it would be the one that you looked up later in life only to find out that they got mixed up with the wrong crowd but eventually settled down and became a Civil War reenactor. If TITLE 13 were a branch of the United States government, it would be a rogue Food & Drug Administration. If TITLE 13 were a film, it would be a cross between a Coen Brothers movie where John Goodman plays an incarnation of the Devil and a Mel Brooks movie with a musical number about the Census. If TITLE 13 were a couch, it would have a spring poking through the cushion and smell like farts, but it is easily one of the most comfortable couches around. If TITLE 13 were a sport, it would be whirlyball. If TITLE 13 were a smell, it would be pungent and harmful, but oddly satisfying, like model airplane glue. 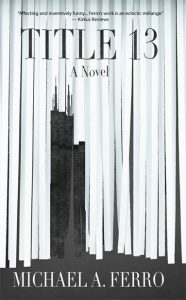 If TITLE 13 were a city, it would be a massive, sprawling Midwestern metropolis with a dense and lively city center, brimming with skyscrapers, that stimulates some residents to do wonderful things with their lives, while others would become no more than a red rash on the sidewalk, forgotten save for the memory of loved ones. If TITLE 13 were a carbonated beverage, it would be pop—not soda or Coke, for Pete’s sake. 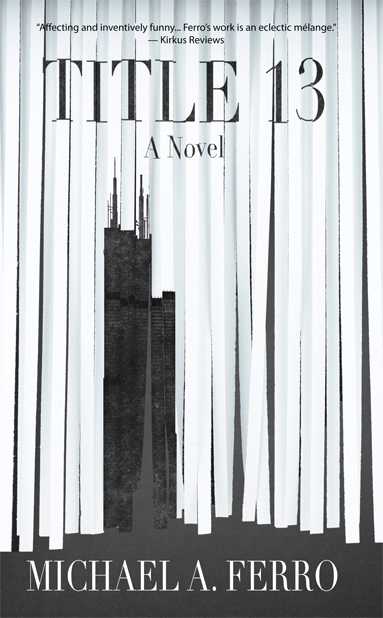 Michael A. Ferro’s debut novel, TITLE 13, was published by Harvard Square Editions in February 2018. He has received an Honorable Mention from Glimmer Train for their New Writers Award, won the Jim Cash Creative Writing Award for Fiction, and been nominated for the Pushcart Prize. Michael’s writing has appeared in numerous literary journals and anthologies. Born and bred in Detroit, Michael has lived, worked, and written throughout the Midwest; he currently resides in rural Ann Arbor, Michigan. Additional information can be found at www.michaelaferro.com and @MichaelFerro.